OK, so this sort of leads on from my post earlier about the cinema field. The official lineup has now been released on the official Glastonbury festival website… but as with last year, it bugged me that the listings were so split up and arranged by stage then date – Ive already got a good idea in my head of who I want to see, so I want it to be in alphabetical order so I can skim the list quickly. Oh yeah, and after my attempts at throwing together a spreadsheet of the lineups last year proving to be pretty popular, Ive had another go this year. So now you can order it however you want – exciting eh? 😉 Click here to download the full Glastonbury 2008 lineup spreadsheet. Amy Winehouse does a pretty good live set, for a crackhead. Plus the Verve, Fratellis, Kings of Leon, The Enemy, Groove Armada, Fatboy Slim, The Zutons… the choice is immense. This is already making for a fantastic festival. Tagged in: glastonbury, glastonbury 2008, lineup, music. we are also playing the love bullet stage on friday and sunday! Ive never even heard of the love bullet stage! My better half was doing a search for things Glasto and found your site. She’s in her office, I’m in mine and she’s just IM’d me with your URL. She says all her mates just go to the pub and stuff and all my chums do things like, um, you. WordPress, Flickr, Twitter etc etc. Must be a bloke thing. Anyhoo, we’re in Leeds, we’re off to Glasto (again) and we camp in the Cinema Field, well next to it. Never thought about camping up that way – just looking at the map now, is it Woodsies or Wicket Green? 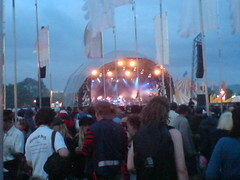 They look good – close to pyramid and other stage but not close enough to get trampled on! Is it on a hill?? Wicket Ground. If you come in through the Yellow Vehicle Gate you can park quite close to entrance A. Then it’s a quick left turn through into the camping field. It’s fairly flat up until about halfway then it climbs up to the fence at the top. We were there in 2005 when the place was under water from Friday onwards and last year when it just rained. We were pretty dry and no mud in the middle to upper parts of the field. And, you can just pick up your camping chair and treat the Cinema Field just like your very own home cinema system.